Get more from your digital cable with these features found on a BMU Digital, HD or HD DVR set-top box. 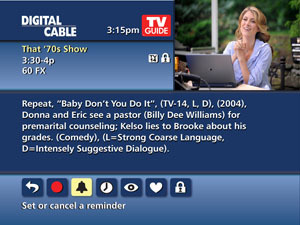 Enjoy an interactive program guide, Watch in HD (when available), Search and Record, DVR Menu and other features make finding and recording shows a snap. Download a User Guide to help in programming your BMU Universal remote to work with your TV or another device. 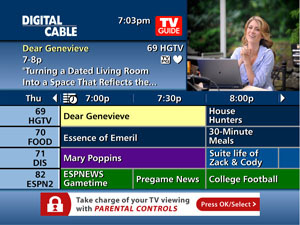 If you’re an HD subscriber, you can find HD channels easier with the enhanced Flip Bar. 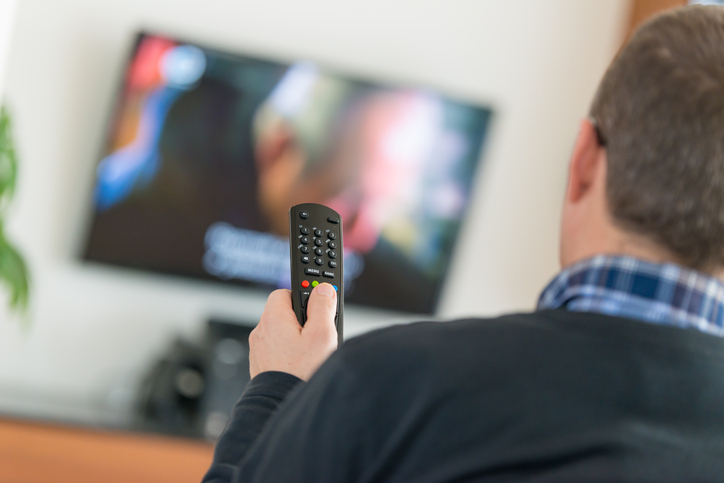 The Flip Bar appears when you press INFO on your remote or change channels and will indicate if a standard definition channel is also available in HD. 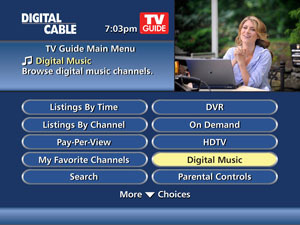 Just click OK/SELECT on your remote to tune to the HD channel. Looking for shows about ‘lions’ or want to make sure you don’t miss any movies starring Meryl Streep? It’s easy with i-Guide’s expanded Search and Record. Search results will provide a list of programs airing on TV up to the next two weeks that meet your search criteria. Use the arrow buttons on your remote to highlight a show or actor. 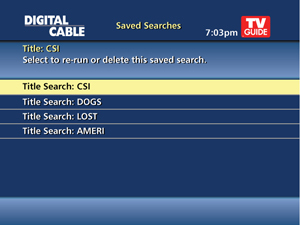 You can Save Searches or set up ‘Auto-Record‘ to your DVR. 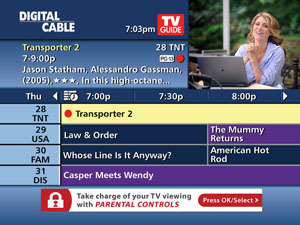 Access the new DVR Menu by pressing DVR from the Quick Menu or My DVR button on your remote. View list of My Recordings, Scheduled Recordings, manage Series Recordings and use DVR Cleanup to easily delete shows you’ve already viewed. Ever wonder why a show didn’t record? With DVR History, you’ll see a list of programs that were deleted or didn’t record and why. 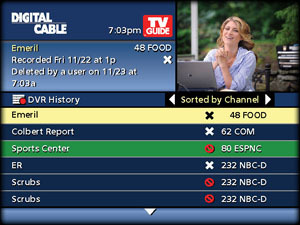 Select DVR History from the DVR Menu to review the list. i-Guide makes it easy to find your favorite shows quickly. 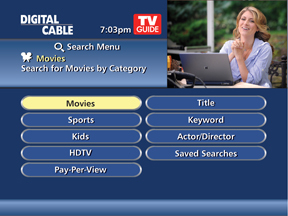 You can search for a specific title, by category or even view a list of HD channels. i-Guide makes it easy for you to find just what you’re looking for. You can save your Title Search for quick access anytime. From the Title Search results screen, highlight Save Search. Access your Saved Searches from Search Menu to run a new search result. Use the Action Icons on the Program Info screen to set a Recording, Reminders, Favorites and Parental Controls. 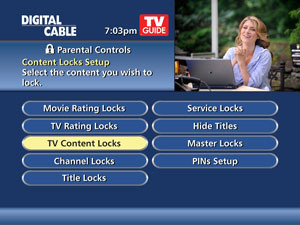 i-Guide gives you the tools to set Parental Controls based on your family’s viewing preferences. Looking for shows about cooking or want to make sure you don’t miss any movies starring Meryl Streep? 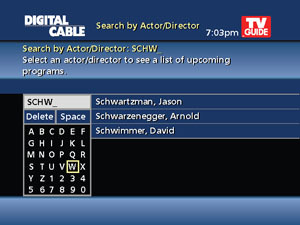 It’s easy with i-Guide’s expanded Search options by Title, Keyword or Actor/Director. Search results include a list of programs airing on TV up to the next two weeks that meets your search criteria. 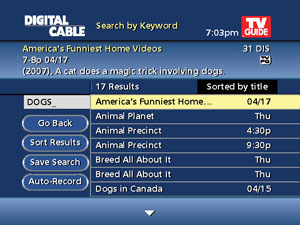 For example, Search for the Keyword ‘dogs’ and your results will show programs with the word ‘dogs’ in the title or program description. 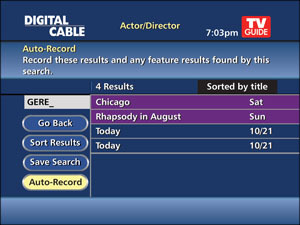 From any Search results screen, highlight Auto-Record and your DVR will automatically search and record programs based on your search criteria. 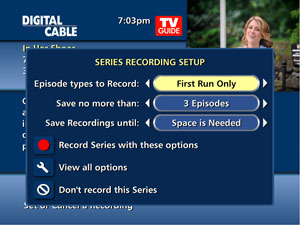 Auto-recordings are included in your Series Recording list. It’s simple to use your DVR to record every episode of your favorite series. 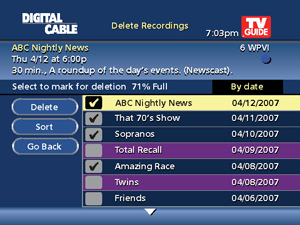 From the DVR Menu, select DVR Cleanup to delete multiple recordings at once with a simple check box. Just highlight the shows you want to erase and select ‘Delete’. Copyright © Rovi Corporation. All rights reserved. Rovi and the Rovi logo are trademarks of Rovi Corporation.